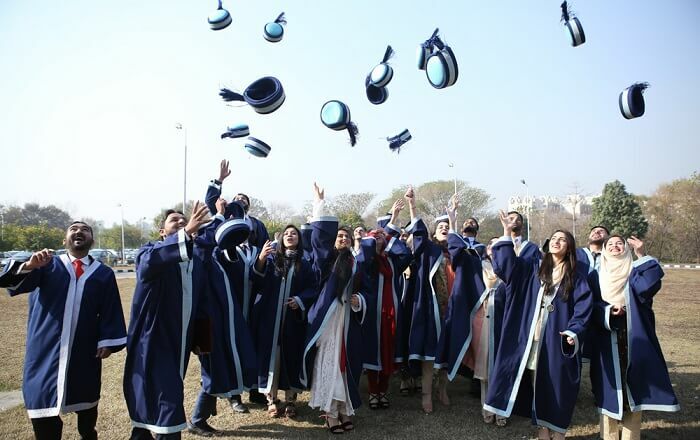 Islamabad: Degrees, gold medals and awards were conferred upon as many as 213 graduates in the 5th Shifa Tameer-e-Millat University (STMU) Convocation held at the Jinnah Convention Center, Islamabad. The ceremony was marked with deep appreciation from the Deans, faculty, parents, and friends, high motivation by the Vice Chancellor Prof. Dr Mohammad Iqbal and best wishes for the graduates by the Chancellor, Dr Manzoor H. Qazi. Legendary nuclear scientist and national hero Dr. Abdul Qadeer Khan was the Chief Guest of the Convocation while Dr Mukhtar Ahmed, Chairman HEC was also present as Guest of Honor. Congratulating the students, Dr. Abdul Qadeer Khan said that the soil of Pakistan is ideal for the dreamers who wished to find the interpretation of their dreams with skills such as positive thinking and hard work. He laid stress on the graduates to support the vision that aimed at placing Pakistan among top of the world in terms of education and research. Dr. Khan advised the students to abide by the oath they take today. “We all avow to struggle for making this country a welfare state where everyone is allowed to spend life of the basis of social justice and where everyone can live in peace honor”, he concluded. Vice Chancellor Prof. Dr. Mohammad Iqbal in his inaugural speech, welcomed the guests and congratulated the graduates and their parents. He said that STMU had started its journey of knowledge in 2012 and today it has made a name for itself because of its groundbreaking research in Healthcare and quality education. The Vice Chancellor mentioned successful range of various Activities held at the University premises on the themes of Medical Healthcare Facilities along with nursing care, Pharmacy, Physical Therapy and Medical Technology. He emphasized the graduates continue with the process of learning throughout their lives. Dr. Mukhtar Ahmed, Chairman HEC also congratulated all graduates and their parents. He said STMU was one of the finest institutions that is building positive image of the country. He said he had visited many universities and found Pakistani students possessing excellent skills and abilities that could be used for the betterment of the country. The HEC Chairman said that trustworthiness, honesty, integrity and loyalty were the only principles that would upgrade us as a nation. Later on, they gave away degrees, prizes and medals. Science in Medical Technology (ASMT) and 11 MBA graduates. Dr. Muhammad Faizan Khalid was awarded with ‘Dr. M. Amin Gold Medal’ for showing outstanding performance in 1st Prof (Part-1), Dr. Syed Ali Raza Gillani was awarded with ‘Dr. Syed Qamar Alam Gold Medal’, ‘Dr. Zaheer Ahmed Gold Medal’ and ‘Dr. Nazeer Ahmed Gold Medal’ for showing outstanding performance in 1st Prof (Part-2), 2nd Prof and 3rd Prof MBBS respectively, while ‘Dr. Syed Touqeer Ali Shah Gold Medal’ was awarded to Dr. Ayesha Hassan for her outstanding performance in Final Prof. MBBS. One Gold and one silver medal for MSN students were awarded to Sajjad Ahmed and Asia Nazir on achieving first and second positions respectively. Two students of MBA Hina Nisar and Maria Iram received Gold Medals for acquiring 1st position, while two silver medals were awarded to Sundas Khalid Khan and Iram Batool for acquiring 2nd position. One Gold and one silver medal for ASMT students were awarded to Umar Zaman and Rabia Bukhari on achieving first and second positions respectively. 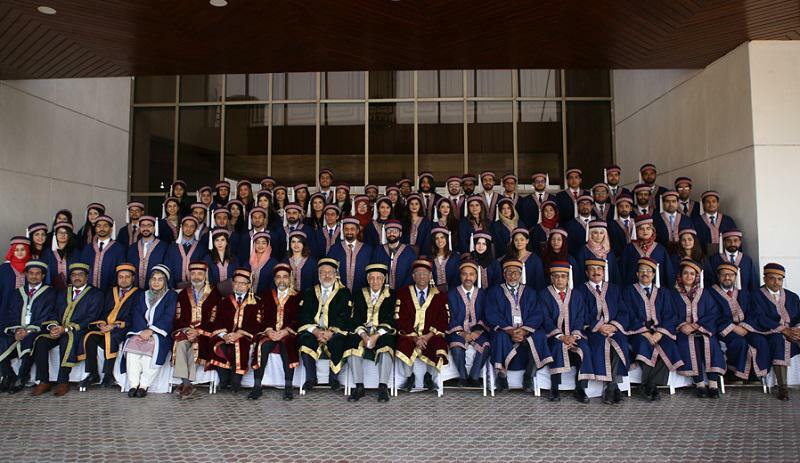 Certificates of distinctions were also awarded to high achievers of MBBS, BSN, PRN, MSN, ASMT and MBA.